My children could not wait their turn to document a field trip in our Exploring Creation Field Trip Journal, by Apologia Educational Ministries. We had to draw straws to decide who completed a page first! My children are creators; they draw, write poems, reports, and stories any chance they get. 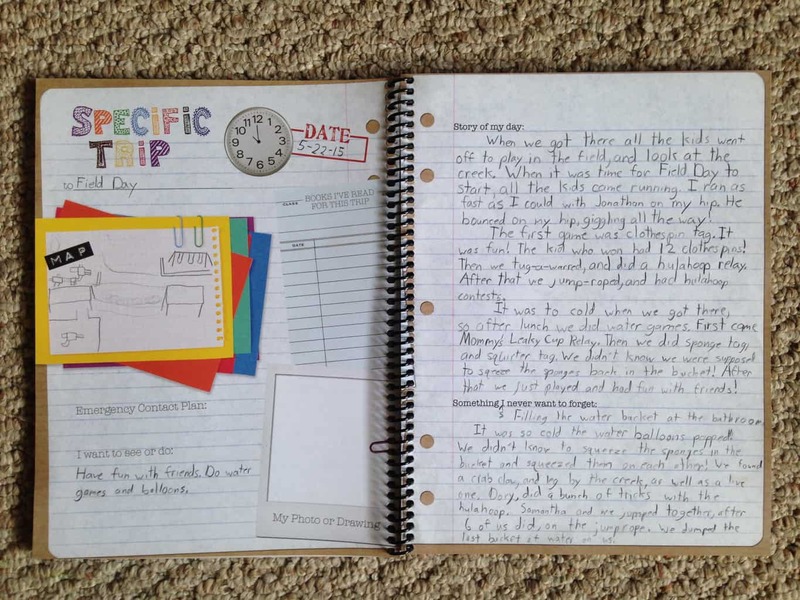 This Journal is a great way to organize all our field trip memories and what we learned into a keepsake. I really think that drawing and/or writing about field trips helps the information actually stick long-term, rather turning into just a memory of an adventure, the new knowledge sticks too. As a family, we love to adventure and this book is the perfect resource to document our adventures and what we learned, loved, and saw. The book not only serves as a scrapbook of adventures, but also as a nature journal since it has pages to draw or write facts about nature observed or studied. Here is a picture of on of the ‘Specific Trip’ pages as filled out by my 5th grader. It includes section for where we went, the date and time, books the student read to prepare for the trip, a map, a photo or drawing, the story of the day, something I never want to forget and more. Special Spot pages are really neat, because it encourages kids to concentrate on a small spot to observe the changes nature goes through in each season. Students can use a grid page to draw a scale map of what they see each season, along with recording some notes, the location, date, temperature, rainfall, and inserting a photo or drawing. We plan to observe our own yard for these pages. On page 6 Apologia includes a chart of field trip ideas, but the most helpful part of the book comes at the bottom of this page. It’s a password and web address that grants access to a ton of extras such as virtual field trip ideas and state maps. It’s a huge resource, I can’t even begin to explain just how much is included in the ‘extras,’ certainly enough to qualify as another entire book if printed out! Links for field trip ideas (you can even search locally!) would take hours and hours just to look through. I’ve already book marked several locations in my state and near where grandparents live to visit on future field trips! My kids especially loved the field guide and identification links, they love nothing more than figuring out what rocks are in our yard, what bird they spotted or what bug is crawling along the sidewalk. I really like the links for lesson plans to coordinate with field trips and the ideas for follow-up activities after field trips. I would probably pay the cost of this book just for access to that extras page! Seriously!